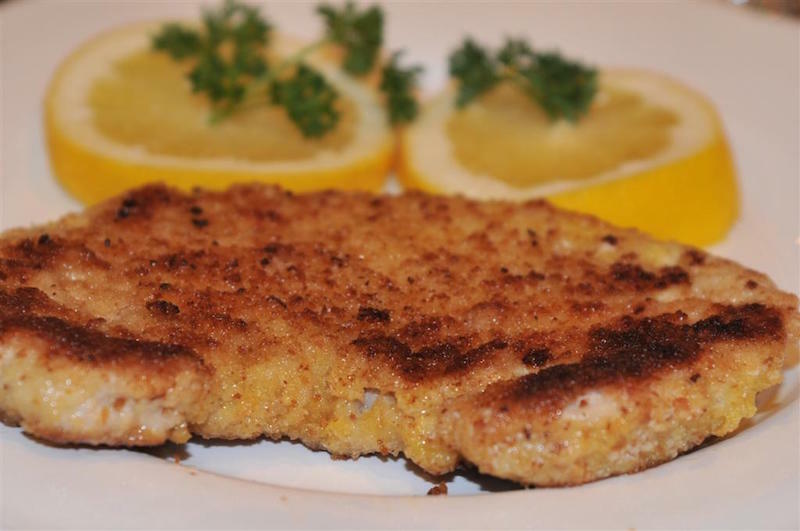 Today we show you the Original Wiener Schnitzel recipe. Wiener Schnitzel is the most popular meat dish known in other countries. Very interesting is its origin. The Wiener Schnitzel recipe comes originally from Austria and the name is protected by law and it has to be cooked with veal. In Germany we enjoy it a lot with pork instead of veal, and in this case it is called "Schnitzel Wiener Art", or "Wiener Schnitzel vom Schwein" (in Austria) to differentiate it from the original. Some say it is not originally from Austria. It might be originated from the Northern Italian city Milan, and called "cotoletta alla milanese". But on the other side others say it appeared in Vienna during the 15th or 16th century. And according to another hypothesis, it was introduced in 1857 by the famous Field Marshal Radetzky, who spent much of his life in Milan. So he might have it found in Milan. For the original wiener schnitzel recipe you can use either veal or pork, and it serves 2 people. The photo below shows the Pork Wiener Schnitzel which we call Schweineschnitzel in German, and it is pan-fried. Happy Cooking! You need older bread, preferably German style buns, French baguette or ciabatta. The bread should be very dry and still eatable. Grate the old bread and keep it in a jar. Important: Never use bread crumbs that are spiced with herbs or other ingredients. 1. First pound the meat slices with a metal pounder, so it will be nicely thin. Add salt and pepper to taste on both sides. 2. Turn the slices in flour, hold them vertically up and slightly beat both sides with the fingertips. This is the way how to get rid of too much flour. There should be only a very thin layer of flour on the meat. 3. In a deeper dish beat an egg, on a flat plate have the breadcrumbs. 4. Turn both sides of the Schnitzel first in the egg, let it drip, followed by the bread crumbs on both sides. 5. Press them slightly so the crumbs are not sticking too much on the Schnitzel. 6. Fry them right away. Important: If you leave the Schnitzel uncooked for too long, the schnitzel will get moist which will ruin the panade. 7. In a heavy pan melt clarified butter or lard (the old Austrian school recipe is demanding lard indeed). Add so much fat so the meat is swimming in it (at least 2-3 tbsp clarified butter). 8. Turn the slice when one side is done. Shake the pan several times so that the lard is being in contact with the upper side of the panade. The secret is that the panade should not be sticking along the meat. Make this test: You should be able to push a flat knife through meat and panade. There should be a gap between the meat and the panade. 9. Melt butter in a separate pan until it is bubbly; roll each Schnitzel in the butter (this will add the authentic taste). 10. Place each Schnitzel on kitchen paper to remove grease. It should not be greasy at all. Wiener Schnitzel is never served with or in gravy. This would be, per the Austrian original recipe, a crime! You serve it always with a little garnish of parsley and a slice of lemon. That's all. It's not that difficult to make and the taste is incredible. Mixed salad (lettuce, potato salad and carrots); fried potatoes or French fries (a potato side dish would be the best combination). Find below a veal chart but it is also valid for pork. Number 6 and 7 is only for veal. The number 11 can be used for any kind of schnitzel. The number 7 is the best and highest-prized choice. This is a very confusing recipe…is this a translation? What is ghee? And why fry the Schnitzel twice? the recipe is correct, ghee is clarified butter and no, you don’t fry it twice, the second time you just add it very briefly in butter, so that is not frying. What is the recommended cut of the pork? My butcher hasn’t a clue and neither do I. Would love to have the large cut like I always had in Germany. Ham and lower Back. I use sometimes the meat from Trader Joes – it is small slices of pork like pork chops but without the bone. Will place a “veal map” to the recipe. Steps # 6 and 7… you bake them first and then fry them ? Bake for how long at what temperature ?? you fry them and then roll them briefly in melted butter.